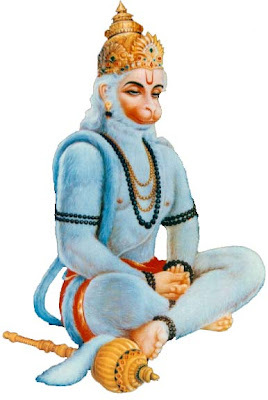 One of the famous incidents in Ramayana is Hanuman creating a seat using his tail and sitting in Ravana’s court when he is denied a seat by Ravana. Hanuman reaches in Lanka in search of Sita and finds her in the Ashokavana garden. Hanuman gives the message from Sri Ram and decides to test the strength of Ravana. He wrecks havoc in the garden and kills numerous soldiers and Akshaya, the young son of Ravana. Finally, Hanuman is ensnared by Indrajit, the eldest son of Ravana. Indrajit had to use a divine noose to capture Hanuman. Bound by Indrajit, Hanuman is brought before Ravana who sits on a high majestic throne. Since Hanuman is a representative of Sri Ram, he requests to be given a seat in the court and treated with dignity. Ravana refuses him a seat and mocks Hanuman for his monkey form and Sri Ram for sending a monkey as an emissary. Hanuman then causes his tail to expand and then coils it on the floor of the courtroom and forms a high tower and sits atop it with dignity. Hanuman purposefully makes the seat in such a way that it is slightly above Ravana’s head. Hanuman makes his seating higher than Ravana to show the strength of Sri Ram and also out of respect for Sri Ram.